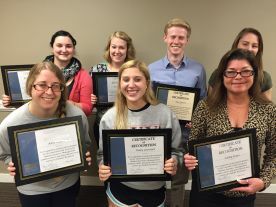 The SHRM student program was formed to give students in the Charlottesville area the opportunity to learn about the human resources field from local experienced professionals. The program gives students the opportunity to gain a broad overview of HR through talks by human resources experts as well as active discussion with peers interested in the human resources field. Members also are able to connect with local human resources specialists of all fields of HR to receive personal advice and guidance. Many past members of the group are pursuing careers in human resources and group membership continues to grow due largely to the positive word-of-mouth and current member referrals. The program benefits not only the student members, but also local HR community and the profession as a whole. The SHRM student group consists of three components that allow members to get insight into different aspects of HR. Monthly Student Meetings: Meetings are held monthly where members congregate on UVa grounds to facilitate discussion on key human resources topics. At each meeting a local HR professional will present on a different aspect of human resources. These meetings allow students to gather in a small group setting to learn from experienced HR professionals and discuss with their peers subjects relating to human resources. Meetings are held the first Wednesday of the month, 5:30 - 7:00 PM. Monthly SHRM Chapter Meetings: Members are invited to attend the Charlottesville SHRM monthly meeting on the second Tuesday of every month. At this meeting students have the chance to listen to a speaker during lunch as well as the opportunity to network and speak with Charlottesville SHRM members. Mentoring: All members are paired with a mentor who is a human resources professional in the local area. Mentoring gives students the opportunity to create a personal relationship with a human resources expert to acquire knowledge and advice. Mentors and mentees are generally meet at least once a month to stay in touch, which gives students and mentors the opportunity to direct conversation and activities in a way that fits their professional and personal interests and goals. Cohorts meet during the academic year and are formed in the spring for the following school year. However, we welcome new members all year long. Contact our Student Relations Chair, Jennifer Mackrous, for more information.